Have you been to Texas? They're pretty proud that "Everything is big in Texas." You can tell by looking at their huge capitol building with framed portraits of their long line of distinguished governors climbing several stories up the walls of the rotunda. It's pretty clear they like big there.I'm not a fan of big. Which is why at Floris,which can be quite big, I tend to seek out the small. Small groups, small conversations, small services. I don't like crowds. Don't like to search for parking or for a seat in the sanctuary.That's why I go to the Easter Sunrise service. Amazingly, there is always a collection of hardy folks who do the same. Adults, kids, even teens shiver in the cool of the morning as the birds sing along with the bell prelude. In the dim light westrain to make out the words of the call to worship in the bulletin. This year I came prepared and punched the flashlight app on my cell phone. Suddenly we were a small group gathering in its light to sing Christ the Lord is Risen Today. Acapella. We let Yoon hit all the high notes. Barbara and Tom welcomed us to Easter morning. I am grateful to Barbara who invited us into the story of Easter with a bit of humor from a children's sermon she had heard about. The children were asked, 'What were Jesus' first words to the disciples after He was raised from the dead?' A little girl waved her hand, "I know," she said, "Ta da!" We laughed. Then we sang. We praised. We proclaimed Christ risen, indeed. Then weheaded to our cars and our homes, to hide eggs, cook meals, waken kids to attend the "big" Easter service.But before I could go I felt a tap on my shoulder. It was an old friend and hisdaughterwho don't normally attend Floris. They had come just for the sunrise service. He pointed over my shoulder. "The sun hasn't even risen yet." And so it hadn't. Who goes to the sunrise service and doesn't wait to see the sun rise? The parking lot had emptied but this father and daughter stood together and watched as the sun rose over the townhouses in the distance. 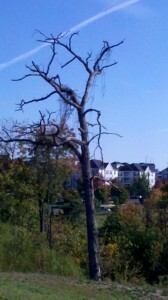 The cragged, leafless tree greets it every morning. No applause. No fanfare. Not even a "ta da!" Feeling a bit sheepish I looked again at the Easter scripture from Mark's gospel. "Very early on the first day of the week, when the sun had risen, they went to the tomb. "(Mark 16:2) The women had waited for the sun to rise before they went to the tomb and that made all the difference. Because by the light of the Son everything looks different. The post Sermon Response: Ta da! ~ by Wendy LeBolt appeared first on Today I Saw God. What a crowd on Christmas Eve. Even though we arrived in plenty of time for the service, there was already quite a crowd gathered. Two other families had to slide down in the pew to make room for the five of us. Isn't it funny how we are reluctant to cozy up to the person next to us when there's plenty of room but happy to slide down when there isn't? Now, I promise this was not what I was thinking about on Christmas Eve, but early the next morning when I was sipping my coffee before the children were up I thought again about that innkeeper – the one who had no room for the straggling couple about to be parents to the Holy child. "No room" is how I order my coffee at Starbucks. Grande bold, no room. This startles most baristas because they are used to complicated instructions: double this, skinny that, extra hot, no whip. They look at me kind of funny when all I want is a cup of coffee. But they comply, filling it all the way to the top. No room means fill it up. I don't want to mix any of that other stuff with the pure, good caffeinated brew. I admit I am especially amazed when some folks who forget to order "with room" actually spill out (!) some of the premium, triple-filtered extra bold coffee in order to make room for cream and sugar and all the fixings. I am a purist, after all. There are so few of us left. But every now and then I wonder what the coffee fixins might taste like in my coffee. Of course, I would never be able to sacrifice any coffee, so I would probably pour the sugar and cream right into the top of my grande personal cup and attempt to stir. Everything would be so full it would spill all over the rim and splash onto the counter and I'd be grabbing napkins to clean up the mess. Avoiding the disapproving glances from other patrons I would slink to my seat and slurp from the brim. It probably would be pretty tasty. For a moment on Christmas morning, I imagined this scene and it reminded me that this is Paul's hope for the people of Ephesus, "to know this love that surpasses knowledge, that you may be filled to the measure of all the fullness of God." (Ephesians 3:19) Wouldn't you know that this was the verse in the Upper Room devotional on Christmas? You didn't think I came up with this all on my own, did you? So I am just wondering if I, in my righteous black coffee drinking, might really be meant to leave room for the cream of Christ. Making room is a sacrifice I find hard to make. But leaving room for the good that God wants to add, now that's worth pondering. The post View from Monday morning: How do you order your coffee? ~ by Wendy LeBolt appeared first on Today I Saw God.